John 5:24 (MSG) – It’s urgent that you listen carefully to this: Anyone here who believes what I am saying right now and aligns himself with the Father… This person has taken a giant step from the world of the dead to the world of the living. -> Thanksgiving – let us give thanks to the Lord for the gift of life, we are here to see the 7th month of the year, it’s a start of a new half of the year. -> Nation – let’s Pray for our Country that more souls are drawn closer to the Lord and they align themselves with the commonwealth of Zion. -> Also let’s Pray for our Leaders – the President; his health and the Acting President; that the he acknowledges the Lord in all his ways, the Legislature that the Love of God is shed abroad in their hearts to make policies that will Positively impact the Masses. -> Lets Pray for all our leaders in Eden; campuses, city locations and Eden Nigeria that the Lord help them and strengthen them to be great Leaders and to lead us in the way of the Lord at all times so the Kingdom can be fully established in our different sphere of Influences- John 6:35 (MSG) – Jesus said, “I am the Bread of Life. The person who aligns with me hungers no more and thirsts no more, ever“. -> We pray Lord that as we look up unto you that our insecurities are dispersed and we are fed of the bread of life. -> We pray Lord as we feed on the bread of your word we are strengthen to face the troubles of this generation and we overcome because we believe in you. -> We pray Lord that as challenges come our way we align ourselves to your word and our mind is stayed on you. 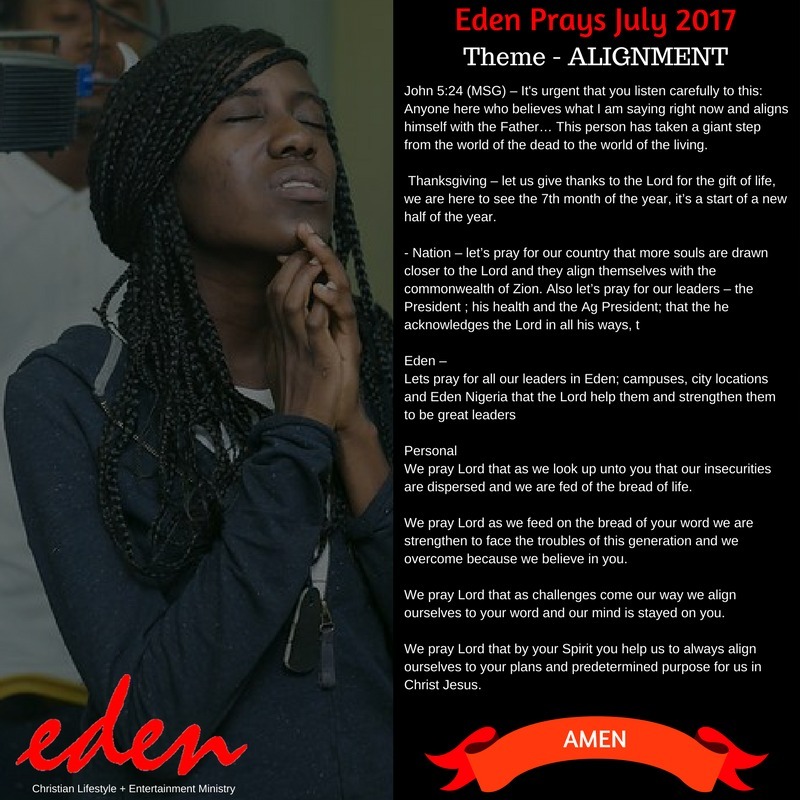 -> We pray Lord that by your Spirit you help us to always align ourselves to your plans and predetermined purpose for us in Christ Jesus.